Dining options on Pride of America are abundant and high quality. Those interested in keeping cash in their pockets will not have a lesser time by going only to free dining options (although the food is definitely better at the extra-fee restaurants) and crew members are happy to accommodate dietary restrictions. For those looking for a more upscale experience, the extra-fee dining outlets are excellent and on par with what travelers can find in any major metro area (with prices to match). Norwegian's Freestyle Cruising mantra extends to its dining. Guests can eat what they want when they want and with whom they want. Seats are not assigned and many restaurants have liberal open hours. Skyline Restaurant (Deck 5): Skyline Restaurant is another main dining room on Pride of America that also serves traditional American food. It offers the same dinner menu as Liberty Restaurant, but breakfast is served here as well. Morning options include eggs and pancakes. Casual dress (shorts and T-shirts) is perfectly acceptable at Skyline. This spot is able to accommodate 574 guests and is open 7 a.m. to 9 a.m. for breakfast and 5 p.m. to 9:30 p.m. for dinner. East Meets West (Deck 5): East Meets West is a small Asian fusion restaurant with dishes from East Asia and South Asia (think orange peel beef, Kung Pao chicken, fried rice, udon noodles and more). Reservations are recommended as without a reservation, you may wait for a few minutes before being seated. Located right next to the shore excursion counter, East Meets West is open for dinner from 5:30 p.m. to 9:30 p.m.
Cadillac Diner (Deck 6): Cadillac Diner is open 24/7 and is the perfect casual place to take a hungry family. The restaurant serves breakfast, lunch and dinner. Options include omelets, French toast and bacon at breakfast. For lunch and dinner, peanut butter and jelly sandwiches, grilled cheese sandwiches and mac and cheese are available on the "kid's corner" menu and entrees range from beef burgers and Buffalo wings to chef's salads and tuna melts. If you are in the mood for a splurge, you can purchase a milkshake (flavors change daily) for $4.50 each (other than the milkshakes, the rest of the food is free). 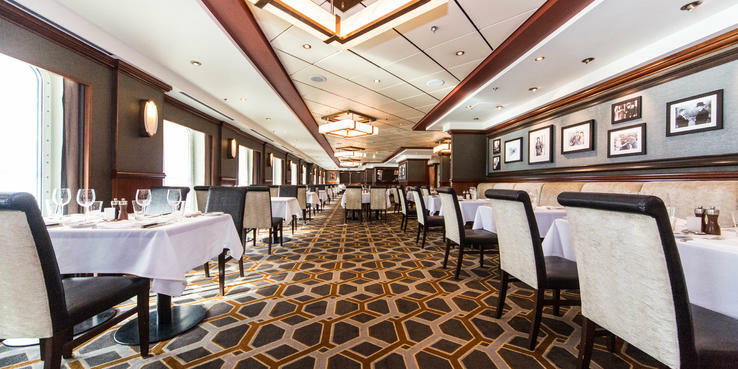 Liberty Restaurant (Deck 6): Those with an interest in American history will feel right at home at Liberty Restaurant, one of Pride of America's main dining rooms, which has a Colonial American theme. Statues of the Founding Fathers as well as large paintings of important moments in the country's history adorn the space. Open for dinner only, the menu includes traditional American food such as seafood, steaks and salads. Appetizers might include crab and cheese souffle and beef carpaccio, while entrees might be shrimp risotto and braised red snapper. Passengers are expected to change for dinner (collared shirts, close-toed shoes and dresses as opposed to flip-flops and T-shirts) at Liberty Restaurant. Open for dinner from 5 p.m. to 9 p.m., and can accommodate 417 diners. Aloha Cafe/Kid's Cafe (Deck 11): Aloha Cafe is the main included dining option on Pride of America. It is a sprawling, buffet-style restaurant with windows on both sides of the ship and a wide variety of food options, depending on the time of day. It isn't terribly crowded and is nicely laid out with multiple food stations across a large area. Seating for Aloha Cafe/Kid's Cafe spans a large area, indoors and outdoors. There is room for 332 people indoor and 338 outdoor. The noise level can get high at peak times. If you are looking for a quieter atmosphere, head out to the bow of the ship to the Aloha Lanai Bar (cocktails, beer and wine are available) and enjoy the fresh air and views of Hawaii. For breakfast, which runs from 5:30 to 9:30 a.m., you will find everything from fresh fruit and oatmeal to French toast, pancakes and eggs. For lunch, typically 12 p.m. to 3 p.m., and dinner, 6 p.m. to 11 p.m., the options are varied and include ethnic choices (Chinese, Thai and Indian), pizza, burgers, salads and a large dessert station with everything from soft-serve ice cream to tarts, cake and cookies. Along with food, there is a bar where you can order alcohol. Children won't feel left out at Aloha Cafe. They are welcome to sit in the main buffet area with their families or can relax in the adjoining "Kid's Cafe" -- a mini version of the real thing. Kid's Cafe includes a buffet situated low to the ground with child-friendly food such as macaroni and cheese and Jello. Key West Bar & Grill (Deck 12): Key West is an open-air bar and grill with high top tables that overlooks the pool area. It is perfectly acceptable to come in your swimsuit and cover-up for a snack. Food includes buffet-style items like sliders, chips and hot dogs, depending on the day. Open 12 p.m. to 6 p.m.
Room Service: Room service items are free (other than the "Special Occasion" section of the menu that includes items for a fee), but there is a convenience charge of $7.95 per order. Note: A tip of $1 to $2 for each order is also appreciated. For those staying in suites, butlers can help organize room service deliveries. Sushi & Sashimi Bar (Deck 5); al a carte: In the same room as East Meets West is this a la carte sushi bar. Try the Two-Timing Tuna Roll with spicy tuna, tuna sashimi, garlic ponzu and chives for $5 or the Californication Roll with soy paper, crab mix, cucumber, guacamole and spicy sauce for $6. Advance reservations are recommended. The bar is open for dinner from 5:30 p.m. to 9:30 p.m.
Teppanyaki (Deck 5); $29.95: Walk through East Meets West into a room on the right-hand side and you will find a series of hibachi grills surrounded by group seating for up to 25 people. This is Teppanyaki, a Japanese restaurant where diners are entertained by experienced chefs making everything from seafood on the grill to steaks and veggies. Entertainment is the name of the game as chefs interact with guests, telling jokes and even playing with food (get ready to have a piece of vegetable tossed in your mouth from afar!). Advance reservations are required. Teppanyaki is open for dinner from 5:30 p.m. to 9:30 p.m.
Jefferson's Bistro (Deck 5); al a carte: The inside of Jefferson's Bistro is made to look just like Thomas Jefferson's library in Monticello. Diners will find food such as mussels ($6.99), bouillabaisse ($14.99), roasted lamb lion ($18.99) and pan-seared scallops ($15.99). Open 5:30 p.m. to 9:30 p.m. Reservations are recommended here, but not required. Cagney's Steakhouse (Deck 6); al a carte: Cagney's is a traditional American-style steakhouse with tasteful decor, muted colors and white tablecloths. Diners can enjoy dishes like crab cakes ($6), lobster bisque ($5), veal chop ($25) and grilled sea bass ($18). Open 5:30 p.m. to 9:30 p.m.
La Cucina (Deck 11); al a carte; Possibly the nicest restaurant on Pride of America, La Cucina is not to be missed. This Italian eatery transports diners to Tuscany with traditional dishes in a high-end setting with velvet touches and white table settings. Perhaps most impressive is the pesto gnocchi ($7.99) and vegetarian lasagna ($8.99). Don't leave without checking out the extensive wine list. Advance reservations are recommended. Open for dinner.